Over the summer, The Juice Online will be featuring players on the 2017 Syracuse football team as we countdown to kickoff. Today, The Juice Online looks at sophomore defensive back Scoop Bradshaw. When Syracuse played in its Spring Showcase in April, two names in the secondary stood out as starters: Sophomore cornerbacks Scoop Bradshaw and safety Evan Foster. Both played mostly played special teams in their rookie years at Syracuse, with Bradshaw seeing some time at cornerback as the season wore on and the injuries started mounting. 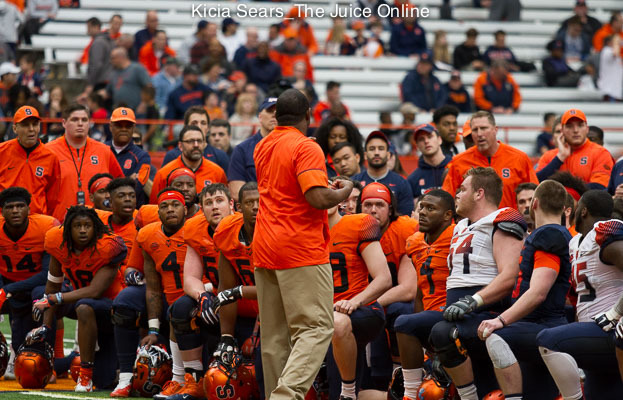 Syracuse coach Dino Babers singled Bradshaw out during his post-game press conference as being a big part of the team’s future in the secondary. Still, there’s plenty of time to go before Babers anoints Bradshaw a starter. He will have plenty of competition in the fall for a defense surrendered 38.6 points per game, ranking a ghastly 120th in the country. 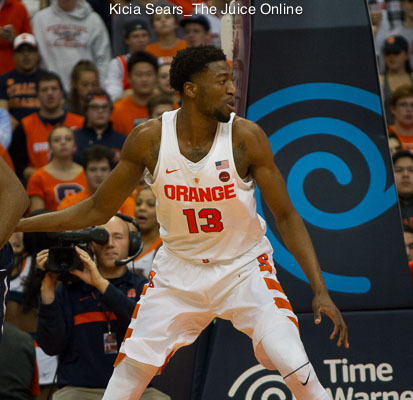 The Orange return Antwan Cordy and Juwan Dowels, who were both injured in Syracuse’s week 2 matchup against Louisville. SU was also without junior safety Daivon Ellison, who led Syracuse with 57 solo tackles. Inside slant: Bradshaw will certainly be in the mix for a starting defensive back position, and has already had a full year in SU’s Tampa-2 defense, unlike Cordy and Dowels, who missed a combined 20 games last season. Career highlights: Bradshaw played in 10 games in 2016, mostly on special teams and occasionally as a reserve in the secondary. He recorded a pass breakup against Boston College, and notched two tackles and a breakup against Clemson. Jim Stechschulte contributed to this report.